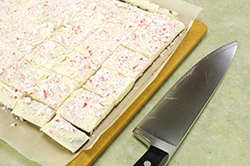 If pumpkin spice is the flavor of November, then peppermint is December’s feature flavor! While certainly popular all year long, mint takes on a distinct holiday meaning in the form of candy canes and other seasonal candies. 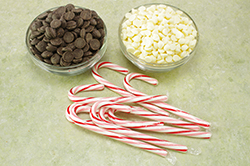 One of our favorite ways to enjoy peppermint this time of year is when paired with white and dark chocolate. 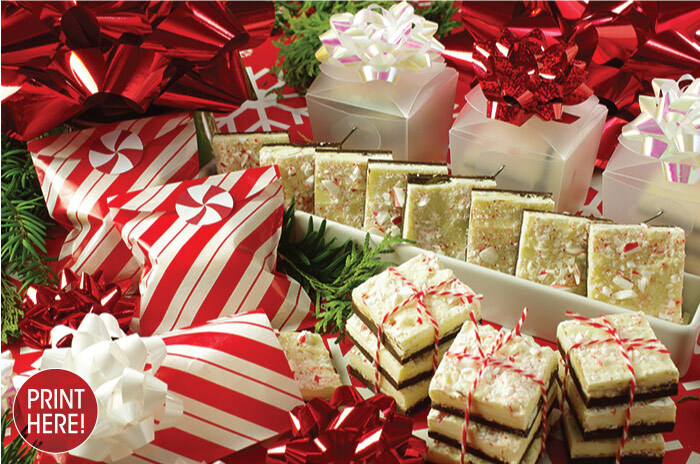 The combination of the two chocolates topped with a crush of peppermint sticks is not only a super-easy-to-make taste treat, but is a visually stunning and festive gift. 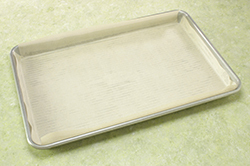 (1) Prepare a 9 x 13 low-rimmed baking pan by buttering the interior surface and lining with parchment paper. (2) Prepare the crushed candy canes by placing the candy in a thick plastic bag. Cover the bag with a kitchen towel to minimize holes in the bag during crushing. 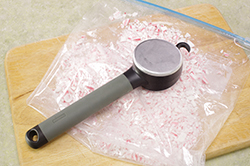 Working on a cutting board, pound the candy with the side of a meat mallet (or hammer) until the candy canes are crushed to the desired consistency. Set aside. (3) In a double boiler, or a heat-safe bowl over simmering water in a saucepan, melt the dark chocolate, stirring frequently. (Take care that no water touches or steam condenses on the chocolate – water will cause melted chocolate to seize.). 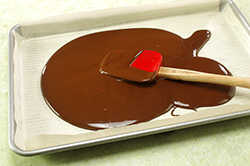 When the dark chocolate is thoroughly melted, pour onto the prepared pan. Smooth the chocolate across the pan forming an even layer. Allow this first layer to cool to room temperature, then harden in the refrigerator for 30 minutes. 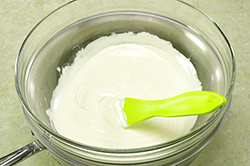 (4) Using a similar melting process, melt the white chocolate in a double boiler, or in a heat-safe bowl over simmering water, stirring frequently. 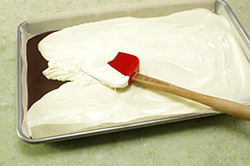 (White chocolate melts at a lower temperature than dark chocolates; take care not to scorch the chocolate.) 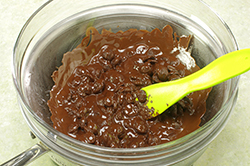 Once melted, pour over the chilled dark chocolate and spread into an even layer. Do this step quickly so that the dark chocolate does not have a chance to melt. 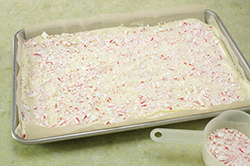 (5) While the white chocolate is still warm, sprinkle the crushed candy canes on top pressing gently into the white chocolate. (6) Allow the bark to cool to room temperature, then place in the refrigerator for another 30 minutes. 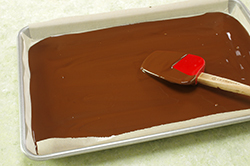 (7) Remove the bark from the refrigerator, and using the parchment paper as a sling, lift the chocolate layers from the pan. Break into pieces, or when at room temperature, score, and cut into squares. Serve, or package for giving.